London Lazerson has created a new speaker system which is equipped with an integrated GoPro mount, enabling you to attach the speaker to almost anything. 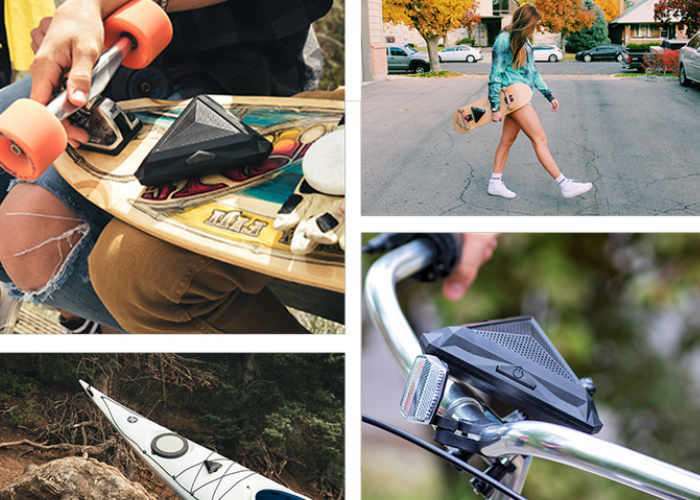 The speaker is also water resistant and enclosed in a rugged outer case which protects the internals from any knocks, bumps or vibrations when mounted to your skateboard, bike or anything else you can imagine. Equipped with a battery that is capable of providing up to 8 hours of use from a single charge the small palm sized speaker is also equipped with a handy microSD card slot. As well as connectivity via Bluetooth enabling you to play tunes directly from your smartphone or mobile device. These speakers are built to withstand anything. The Low profile design and pyramid shape helps it keep its structure under loads of stress. The outer shell is made of a Poly-carbonate ABS blend which allows for a rigid form with some flexibility, helping our speaker to be shatter resistant. We wanted Sticky Sounds to withstand the elements. Rubber clamped seals allow Sticky Sounds to be IPX6 water resistant. You wont have to worry about rapids while kayaking, sudden downpours, or even dancing too hard in the shower. Sticky Sounds also has an emergency float system to keep it on top of the water when accidents happen. To Make Sticky Sounds as portable and convenient as possible we gave it a 3.33 Wh battery that gives it 8 hours of play time while still keeping it lightweight and low profile. Sticky Sounds has a Micro USB charging port on the bottom side, with lights on the power button to let you know when it is fully charged. 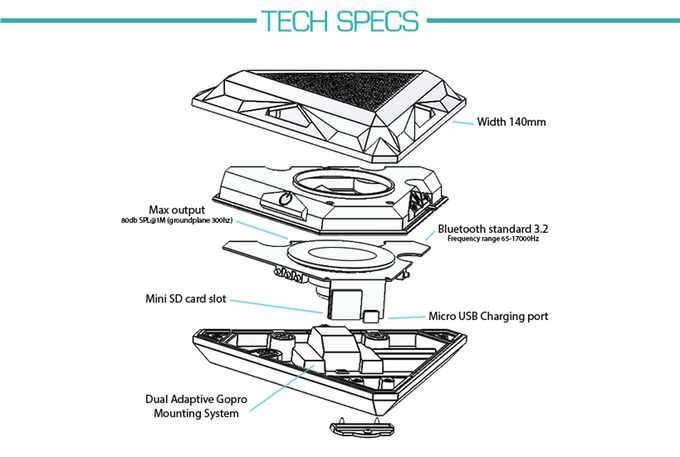 A Micro USB charging cable is also provided with each speaker. For more information on the new Sticky Sounds jump over to the Kickstarter website for details by following the link below.